We are wondering if instead of using strawbales for the roundhouse, we could just use earthbags for the entire roundhouse structure. Thanks. 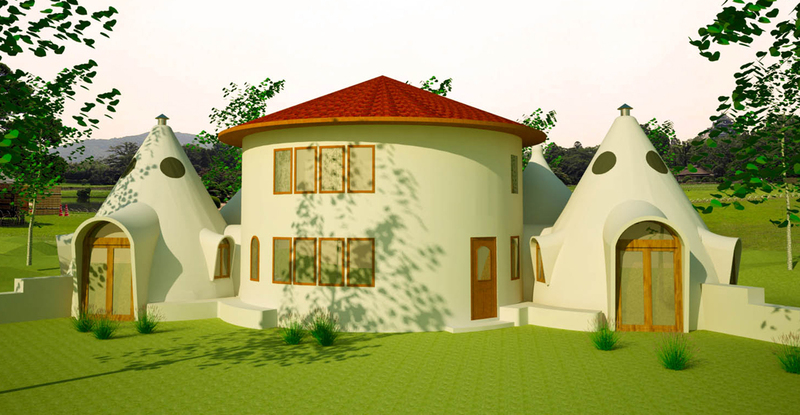 Sure, you can use earthbags for everything — the roundhouse and domes. I absolutely love this plan! I wondered a couple things…one, as a single woman, working with some voluteer help, how long would you expect this to take to build with all earthbags? How many earthbags would it take? Which do you prefer…all earth bags or the combo? How hard would it be to alter to take the doors out of the bedroom and leave only windows? I am not sure I want a door in my young son’s bedroom. Finally, would it be hard to add a studio dome? I am a photographer and I am looking for a sparse area to work in as a studio…it would be nice if it was connected to the house. oh…and…do you think this really could be feasible to do at $10/sq ft? My thoughts are to start collecting recycled doors, cabinets, etc…but, I wasn’t sure about plumbing, electrical, etc. Thanks, glad you like it. I highly recommend starting out with something small and simple — a tool shed, garage or maybe one bedroom/bath. This will allow you time to learn the necessary skills without getting overwhelmed. There’s no way to estimate the time. Some people are slow, some fast. Build a test structure and you’ll learn your capabilities. Choice of bag fill material has a big impact on how long it takes. Building with lightweight scoria will be way faster than moving heavy soil. Small changes such as turning a door into a window take no extra time if you plan for it. Maybe start out with a studio dome! This would be a great first project. $10/sq. ft. is only possible if you go all out to cut costs: barter for used (but strong) bags, all recycled materials, etc. Make a game of it and yes, it is possible. Thanks for the inspirational designs. I am looking to build an earthbag dome house in New Zealand. Have you had anyone build here yet, if so where abouts, and would it be better to do it in the warmer North island climate, I am currently based in christchurch and we have very cold winters here. My only concern is being warm enough through the winter. Have you tried the search engines on our Earthbag Building blog and EarthbagBuilding.com? Earthbag buildings can be designed for most any climate. Search our sites for cold climate earthbag. Im been looking for your place to buy some of the plans you have and yet I seem to be missing it. Just leave a message if there’s something you don’t see.